Helen Simpson, from the Mushroom Shed, interviews Felicity Gordon and Heath Rickard, from Watsonia. Felicity is one of the organisers of Watsonia Library Community Garden and has created the artwork for many local food projects. A beautiful mosaic, a vertical wall of interesting tea pots in all shapes, sizes & colours, and a multitude of lush, green plants on the porch, all greet visitors to Felicity and Heath’s house. It’s hard to believe that, just seven years ago, the house was surrounded by grass, one lemon tree, a rosemary bush and a native tree – and not much else. A contemporary artist, with a background in permaculture, Felicity has not only extensively gardened, but also produced an artistic creation. It’s a magnificent sunny block on a rise, specifically selected by Felicity and Heath for this feature. Now divided into a number of sections, supporting a protected alfresco with outdoor kitchen, huge chook run, attractive circular mandala veggie garden and a multitude of fruit trees, the garden both inspires and relaxes as we wander around. Felicity tells me that her passion for growing veggies began as a child. She grew up on a small farm in Lower Plenty where her family bred horses, plus kept goats, chooks, guinea fowl turkeys and ducks. Of a different time to today, a 10 acre overgrown property nearby provided the local children with hours of fun making tracks, digging holes and making cubby houses from sticks (indeed, it was known as the ‘fun track’). 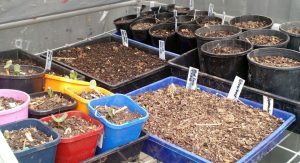 The family went to the shops with re-useable plastic containers, much to Felicity’s embarrassment at the time when young; now, of course, some people have become aware of how this helps the environment and are adopting these ways again. Felicity’s parents were keen on permaculture – in those days, self-sufficiency was the go – and grew numerous fruit and veggies. The meat that they ate was grown on the property, so Felicity learnt at a young age where food came from. Her family also had a share in a larger sheep farm in Millicent, South Australia, where many holidays were spent. This is where she first learnt how humans’ activities can damage the land, with over-zealous land clearing, heavy over-stocking and fertiliser causing salt pans. Much effort went into finding appropriate solutions, including reducing sheep numbers and diversifying what was produced on the land. 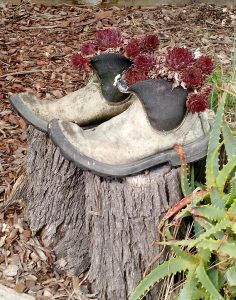 After leaving home, attending university and living in Fitzroy, Felicity has created a garden wherever she lived, even if this had to be a garden in pots. 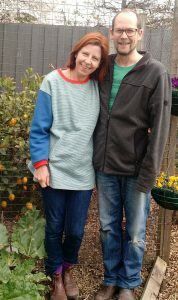 Moving to their block in Watsonia provided Felicity and Heath the opportunity to set up a permaculture system to produce their food. I’m amazed at what Felicity achieves with an obviously busy household to manage at the same time. As discussed below, she tells of her involvement in four related areas. Felicity and Heath grow as much food as possible on their block under a permaculture system. This means that, with some meals, all produce comes from the garden. 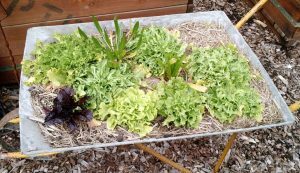 However this becomes more difficult in winter when the produce drops back, meaning only herbs and a few greens are available. During summer, when produce from the garden is plentiful, Felicity makes good seasonal use of her Fowlers Vacola bottling unit and dehydrator – saying it’s like storing summer energy in a jar for use in winter. Eggs are never bought as the chooks provide more than enough, with excess eggs and other produce given to neighbours. They have a dedicated veggie patch and wicking beds. Also, veggies are everywhere throughout their garden, plus numerous fruit trees, including olives, a feijoa, currant, dwarf peach and grape. A side fence supports a lush passionfruit. Plums from a neighbour’s tree are seasonally made into jam by Felicity, with the neighbour only too happy to supply the produce if Felicity does the work making the jam. Various structures assist plants growing – a fabulous tomato cage supports the tomatoes in summer. Following permaculture principles, things that need more looking after are closer to the house, including the compost, which is one of Felicity’s passions (more about her ‘Compost House’ below). A worm farm is made in a bath, with old carpet laid on top to keep in moisture. The chooks make fast work of the barrows of weeds; ditto the well looked after rabbit. Even the dog’s droppings are recycled – a bucket with the bottom removed is placed in a hole in the ground with the lid on. The dog’s droppings are put in there – when full the bucket is easily removed and placed elsewhere, and the top of the hole covered with soil. The outdoor kitchen, still under creation, provides a great space for ‘hot’ cooking in summer, e.g. making chutneys. The children also enjoy the space, being a bit of a novelty. Felicity and Heath are creating the kitchen with everything recycled – the oven and stove came from neighbours – and other materials picked up from the side of the road. Indeed all of their garden furniture is recycled from roadside pick-ups, re-purposed in a creative way. The garden provides the inspiration for Felicity’s art, with artwork based on things that are happening in the garden. Felicity says that her art highlights the relationship we have to nature and food plants, and how much we rely on both for survival. 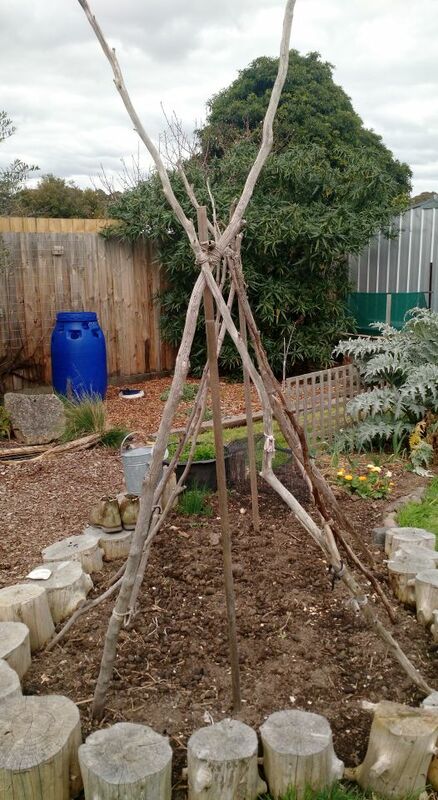 Recently Felicity was commissioned by Banyule Council to create a ‘Compost House’. 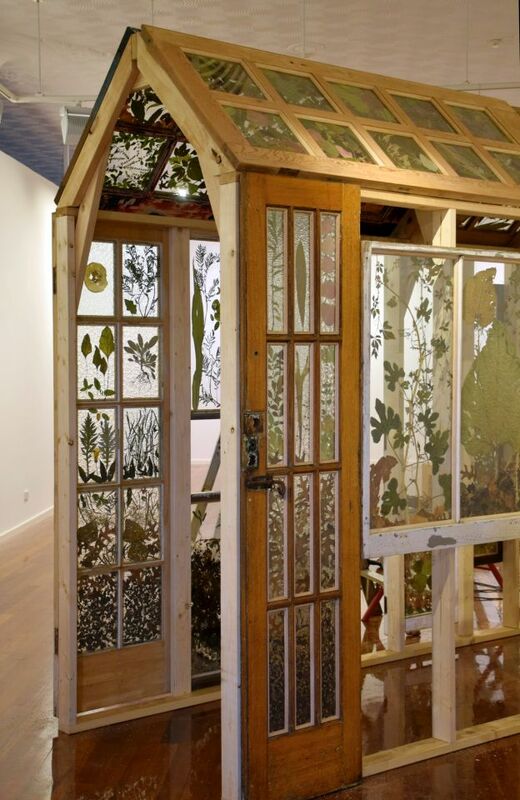 Using recycled windows, the glass in the window frames was double glazed with garden items such as different coloured leaves and textured compost creatively arranged and imbedded between the glazing. Having experience as an apprentice carpenter in earlier years, Felicity was familiar working with wood, which was handy when it came to the window jointing. She was assisted by a local carpenter (Martin Hengveld) in building the ‘house’. 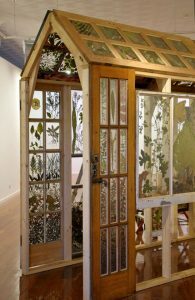 The Compost House, when erected, is as big as a small sized glass greenhouse, and it’s possible to walk inside and look out through the decorated glazed windows and admire Felicity’s creation. 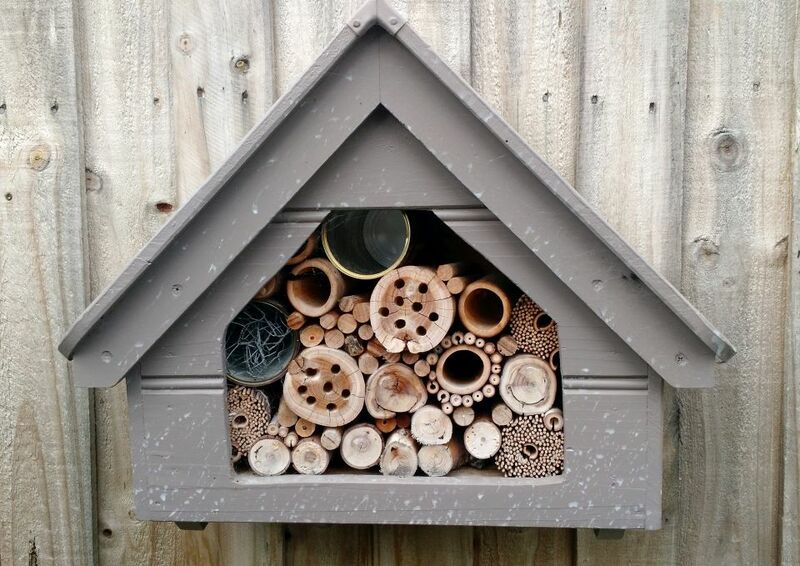 Having a studio in the backyard provides easy access to the garden and much of the garden is interwoven into Felicity’s artwork – she often paints things from the garden, or alternatively uses the items as is in her work. 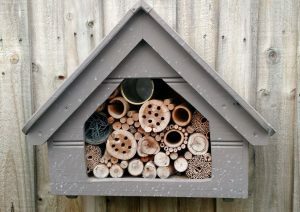 Around the garden, roadside finds are made into sculptures and items of interest – an old gate painted bright red provides an entrance from the alfresco to the garden, mosaic stepping stones have been created by the children, a pair of old boots has succulents growing out the top and an elaborate ‘insect hotel’ filled with creatively arranged wooden holes provides a haven for native bees and insects. One day, sitting in the Watsonia library and looking out the window, Felicity thought it would be fantastic to have a garden outside, with which people could interact. As a result, the Community Garden at the library was started by Felicity and friends some three years ago. 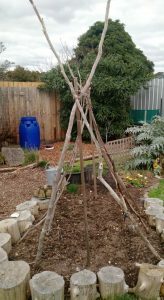 Based on permaculture principles and with a number of alternative techniques tried (e.g. Margot Meredith’s experiments of throwing seeds around and seeing what happens), the garden has grown extensively. Banyule Council is currently considering a grant to plant fruit trees, thus extending the garden further. The garden is open to anyone – there is no need to be a member – people can drop by to garden for a while or simply have a cup of tea. Thursdays from 10am to 11am is gardening time. Produce from the garden is shared and also put in the library on a table for anyone to take. Never has anything been left! Last year there was a big tomato plant giveaway, with people returning to compare how their plants were growing. Another tomato plant giveaway is planned for this November. Participants in the garden come from diverse cultural backgrounds and the sharing of plant and cooking knowledge across these cultures has been extremely beneficial to all that attend – in many ways it’s been more about the people than the garden. Felicity is a keen advocate of Guerrilla Gardening – in the past having established a guerrilla garden in Abbotsford. For those unfamiliar with the concept, guerrilla gardening is the establishment of gardens on land not owned by the gardeners themselves, such as abandoned sites, uncared for areas or other neglected private property. What started as a hole in the fence and was vacant Council land, in over two years was turned into a thriving food producing area and beautiful place by Felicity and her artist colleagues. The community was welcome to the food produced and eventually the local school took it over and maintained it. Felicity’s philosophy is to get as many food plants out there as possible and sharing the produce amongst the community is a big part of this. Felicity believes it’s important to ‘have a go’ with gardening – what works one season may not work the next but it’s important to keep trying. Often there isn’t a right way – it’s just trial and error. Well fed on delicious home-made fruit cake and with a huge bag of lemons under my arm, I bid Felicity and Heath farewell. I am now inspired to go home and make my own creations and immediately make a start on giving the garden furniture a long overdue make over.